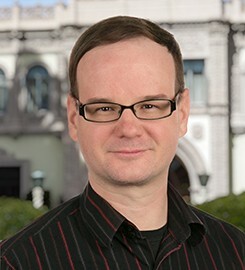 As a web developer for Library and Web Services, David is part of the team that designs, develops, and implements USD academic, administrative, and client websites. He specializes in training and accessibility. David trains maintainers including faculty, staff, and students on how to use USD's web tools, media editing systems, and best practices. This ensures intuitive architecture, streamlined navigation, inclusive functionality, and an elegant presentation across USD’s websites. David's background is in development, usability research, and training. He logged more than 10 years working as a video game developer and an international trainer where he created games with and for our global community. Those experiences have provided him with great opportunities to appreciate the incredible diversity of learning aptitudes and the teaching practices best suited to pair with them. David often applies the skills he honed in the video game industry to "gamify" the USD web presence. This approach allows for a more immersive, interactive, and inclusive web experience. Aside from his professional background, David enjoys reading, participating in hilarious conversations about pop culture, and is a voracious learner with preferences for history, psychology, and neuroscience. Submit changes to David Schmidt's profile.